My advice for beginners is: ‘Avoid PowerShell and SQL!’ My thinking is use SQL’s own tools to extract and present the data. PowerShell is capable of performing SQL management tasks such as backup, but even here I believe that SQL’s native commands are better. I recommend that PowerShell beginners start with scripts that interrogate the operating system. Understanding what PowerShell has to offer SQL is really only for database specialists, or for those who just like to push the boundaries and discover what PowerShell can achieve. PowerShell is great for managing any modern Windows operating system starting with commands such as Get-Process, Restart-Service, Get-Eventlog -Logname system. Then there are excellent PowerShell modules for administering Active Directory. As for Exchange, some would say managing Exchange Server is the killer reason to learn PowerShell. Yet moving on to consider SQL and PowerShell, I find there is no synergy here, it’s just a case of extending what PowerShell can do with the aforementioned operating systems or AD. The crux of the matter is SQL is just not as friendly to PowerShell as Exchange, and there are not many specialist cmdlets. The key to using PowerShell commands on SQL Server is the provider sqlps.exe. It also loads and registers the SQL Server snap-Ins. 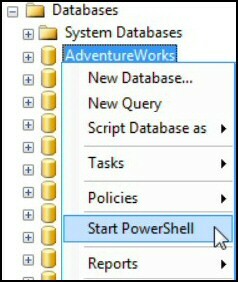 Launching PowerShell is easy enough, just right-click a database and select ‘Start PowerShell’. Trap: SQL 2008 comes with PowerShell v 1.0, and once SQL is installed you cannot upgrade to PowerShell 2.0 or later! Workaround: Install PowerShell 2.0 BEFORE you install SQL. Just to give perspective, check which providers are installed, and which ‘Drives’ are available. One minor irritation is the way PowerShell and SQL interpret the humble \. You have to encode it as %5,. This is another example of SQL not being friendly to PowerShell. It’s not that this is hard, but I keep thinking ‘SQL’ manager does this better, something I never felt when working with PowerShell and Exchange. Note: In common with other PowerShell scripts by default sqlps runs with the scripting execution policy set to Restricted. There are more rewarding places for a PowerShell to start their career than SQL. I could tolerate SQL’s quirks if PowerShell could manage the databases as easily as it manages Exchange Servers. To my thinking managing SQL with PowerShell is just for the sake of it, SQL’s own tools are faster, easier and more comprehensive for both database mining and for server management.